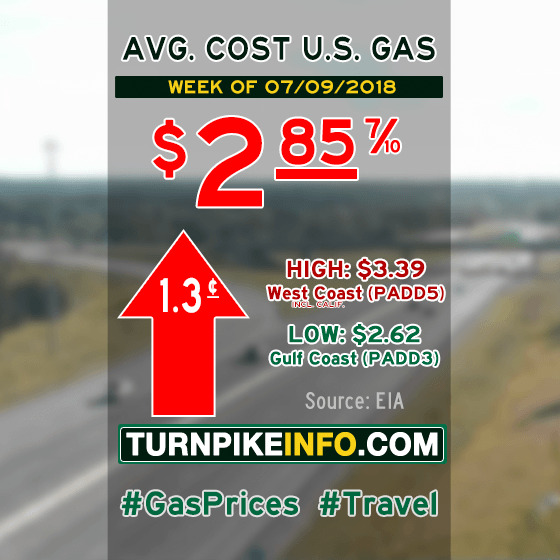 Fort Lauderdale, FL – The nation’s gas prices continued ticking upward during the past week, according to the U.S. Energy Information Administration. The E.I.A.’s weekly fuel price survey shows the cost of a gallon of regular unleaded is now about $2.86 nationwide, an increase of over a penny since last week’s report. Prices went up in nearly all regions, remaining largely static across the Rocky Mountain states. Elsewhere, prices went up anywhere from a penny to two cents per gallon. Diesel fuel prices moved up only slightly, according to this week’s survey report, though most truckers are not likely to notice the change. The average cost of a gallon of diesel increased just over a half penny per gallon, keeping the nationwide average at about $3.24, according to the E.I.A. This week’s average fuel prices for all regions are shown below, as gathered from www.eia.gov.